It’s that time again! Another Wednesday and another amazing female foodie to shower with our love! 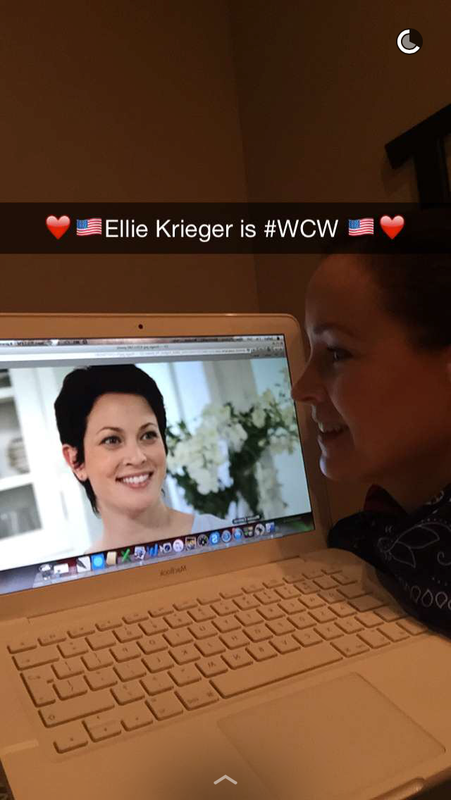 And today’s gorgeous gourmet is Ellie Krieger. Not only is she a best selling cookbook author and television chef, but she is one of the most well known nutritionists in America. In fact she was tapped by the White House to help guide the healthy eating campaign for our nation’s school children. A mom herself, she is a great example of how to feed a family nutritious and balanced food, yet making her recipes super tasty. Since we are still in January and trying to maintain our New Year’s Resolutions, she is indeed the perfect choice for our foodie infatuation this week! Ellie is so warm and engaging and though very esteemed in her field (she has a degree in Nutrition from Columbia University and then taught at N.Y.U) she is still open and approachable. She doesn’t come across preachy, but she really does want to make the world a better place. Not only is she involved with the White House campaign, but she also volunteers her time to various hunger organizations (such as Feeding America) to help all people have access to healthy food. I love her ethos, a snippet of which she shares on her twitter bio: “I believe the words delicious & healthy can and should be used in the same sentence.” Yet what is so amazing is that she doesn’t think it is a privilege for only a few. It should be for young and old, rich and poor. Wow! 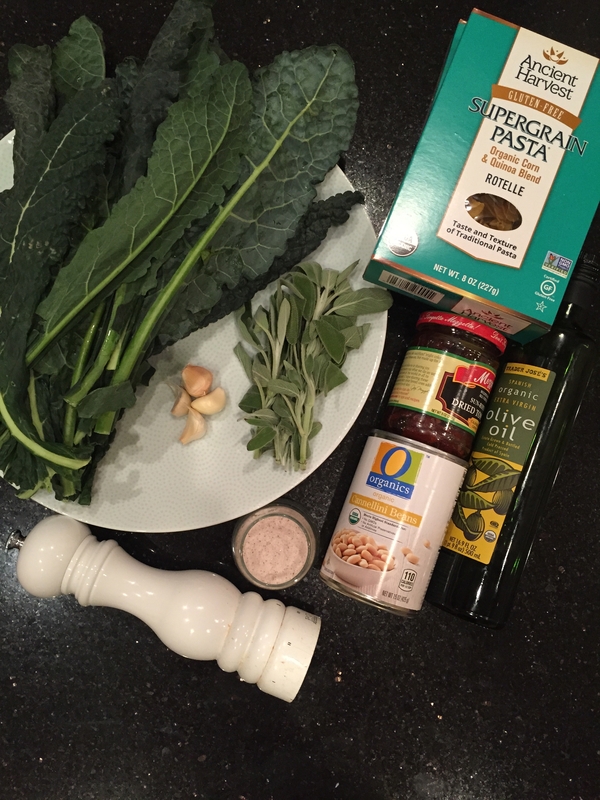 While searching to find the perfect recipe of Ellie’s to recreate for the weekly Woman Crush Wednesday snapchat tutorial (my user name is: blissbakery) I thought it would be great to make an easy and healthy pasta dinner. Since I am still with my family in America, and it is such a busy household, a dish that anyone could reheat themselves when their tummy was calling out for dinner would be a winner. While I couldn’t find orecchiette pasta at the supermarket, I opted for Quinoa (gluten free and high in protein) corkscrew pasta noodles. And I also swapped the escarole for dino kale. Lastly, since my son in law loves his meat, I decided to cook up a bit of nitrate free chicken sausage to add in at the end as well. But judging from Ellie’s recipes, she is very flexible with ingredients, even offering suggesting for substitutions, which makes cooking her recipes a dream! Bring a large pot of water to a boil over medium-high heat. Add a generous pinch of salt, then the dried pasta; cook for 1 minute less than for al dente, according to the package directions. Reserve 1 cup of the pasta cooking water, then drain the pasta into a colander. Meanwhile, combine the oil and garlic in a large skillet over medium heat. Once the oil begins to shimmer, reduce the heat to low; cook for about 8 minutes, stirring frequently, until the garlic is a light golden brown. Be careful not to let it burn. Add the escarole; increase the heat to medium and cook for about 3 minutes, stirring once or twice, until it has wilted. Stir in the chopped sun-dried tomatoes, beans, sage, crushed red pepper flakes, the 1/2 teaspoon of salt and the black pepper; cook, stirring, just until warmed through. If the pasta is not yet done, remove the skillet from the heat and cover it to keep it warm. 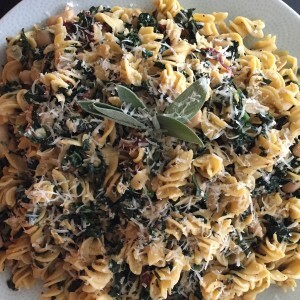 If the pasta is done, add 1/2 cup of its reserved cooking water and the 1/4 cup of Parmigiano-Reggiano to the skillet, stirring to create a sauce; increase the heat to medium-high, then add the cooked pasta, stirring for 1 to 2 minutes or until the pasta is al dente and has absorbed some of the sauce. If the mixture seems dry, add some or all of the remaining pasta cooking water, as needed. Serve right away, sprinkled with more cheese, if desired. This dish is so tasty and yet you don’t feel guilty eating it. Totally satisfying and light at the same time. 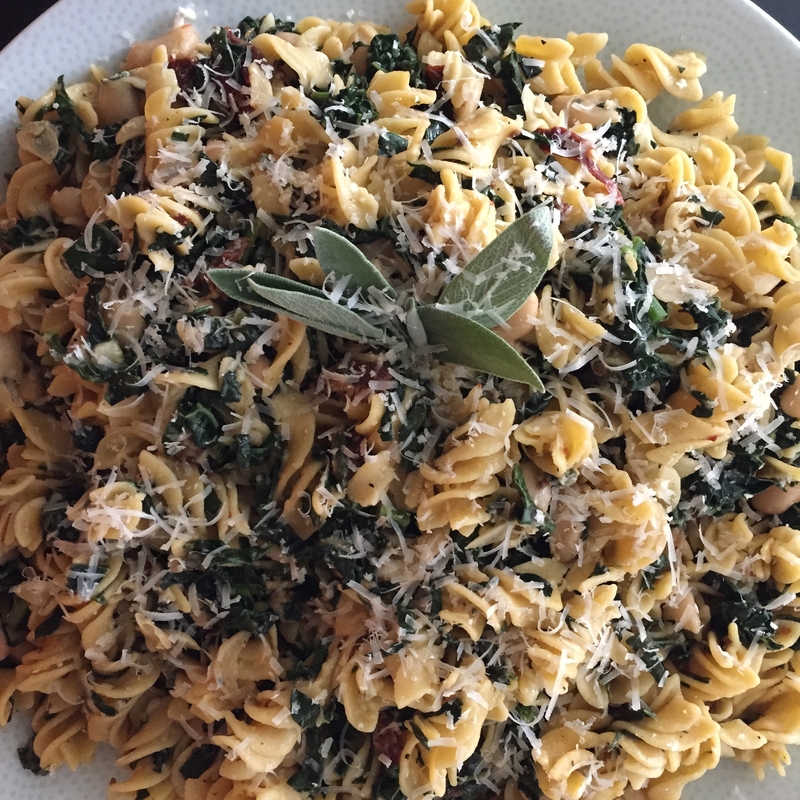 I love the combo of smoky sun-dried tomatoes with the earthy kale, and the salty nuttiness of the parmesan cheese is just perfect! The addition of the beans fills out the myriad of textures and also provides great fiber. It really is a superfood pasta dish that the whole family can enjoy. And though my granddaughter is dairy free, it’s no bother as I just didn’t put cheese on her portion. But I am thrilled with the way it turned out and bet that it will taste even better as a leftover reheated for lunch tomorrow. Sometimes people can toe the line with eating healthy for home cooked dinners. Then blow it all when they are starved for lunch the next day and run out of the office on their lunch break to the local burger joint. Being prepared is the key and having some of Ellie’s gorgeous pasta packed in your lunchbox makes it a double delight. For dinner tonight and lunch the next day. Yummy! One look at Ellie and you know she has done something right. Absolutely stunning! But clearly her beauty is more than skin deep. She is smart, hard working, creative, and altruistic. She is a total inspiration and a perfect choice for Woman Crush Wednesday! Thanks Ellie for all you do! Helping the world eat healthier and sharing your love along the way! God bless you and your family!